Ahh, Taos, the Land of Enchantment. If you notice, the license plates on the cars in New Mexico read Land of Enchantment – a moniker that locals and visitors alike agree is rather fitting. While the beautiful landscape, breathtaking sunrises and sunsets, and endless starry skies contribute to the magic of Taos, New Mexico, much of the state’s enchantment can be attributed to the first people to inhabit this corner of the Southwestern United States. When the Spanish first explored the western U.S. they encountered collections of small villages and referred to the inhabitants as the Pueblo people. Encompassing many Southwestern Native American tribes, the name is still used today to describe these early inhabitants. As you explore Taos, you will certainly discover many tributes and acknowledgements to these early people. From art, architecture, and events around town to notable area landmarks (Kachina Peak marks the highpoint of Taos Ski Valley), the spirit and influence of early Pueblo people is very much alive in the area. However, the best way to experience the lives of these people is to visit them yourself. There are only twenty one surviving pueblo communities today and the majority of them can be found in New Mexico and neighboring Arizona. Next time you visit us at El Pueblo Lodge, we highly recommend making a stop at the Taos Pueblo located just one mile north of town. This living Native American community is nestled at the base of the Sangre de Cristo Mountains and is both a National Historic Landmark and UNESCO World Heritage Site. The Taos Pueblo has been inhabited for over 1,000 years and, today, nearly 200 people still reside in this community full-time. With so much to do in the Taos area, visiting this pueblo often slips between the cracks of the guest experience. Being a UNESCO World Heritage Site is reason enough to stop by, but the true allure of the Taos Pueblo is its people. Friendly, spiritual, and tied to the Earth, the Pueblo people truly live an amazing life. Of the remaining Pueblos in the United States, some say Taos one of the more private and conservative. Thankfully for you, however, that does not mean all doors are shut. The people of the Taos Pueblo are incredibly proud and enjoy sharing their life and culture with visitors. 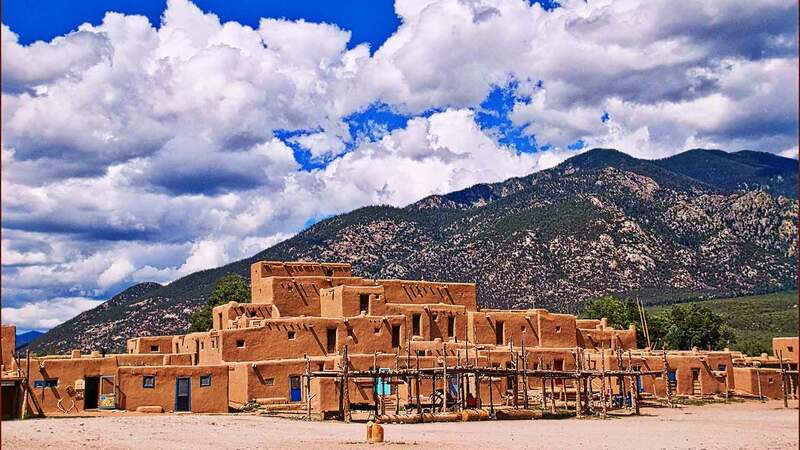 Whether you decide to visit on your own or schedule a tour with one of the locals (highly recommended), visiting the Taos Pueblo provides remarkable insight into a culture and people that are extraordinarily in tune with the world around them. New Mexico is certainly a Land of Enchantment, and much of this can be credited to a group of people more tied to the value of community and natural world than any other population in this country. In an era marked by political quagmires, distrust, and fear we all could benefit from visiting and learning a bit more about the culture and people that have made New Mexico such an enchanted place. Whether in Taos for adventure, leisure or communing with the arts, stay at the El Pueblo Lodge. We are located in the heart of Taos and close to the TaosCenter for the Arts. With over 50 rooms which open on to patios, a spa tub and an outdoor pool we are the place to stay in Taos.